Members of the Monessen Tobacco Free Coalition present the Tobacco Free Stop Sign to Heather Prinkey to hang at Brewer's Stadium in Belle Vernon. Ms. Prinkey is a coach for the Belle Vernon Youth Baseball/Softball Association. The MTFC recently held its annual Awards Luncheon to honor an outstanding member of the coalition and highlight the Athletic Fields Project. Guest Speakers included Linda Clemons, the leader of the Minority Health Task Force for the Washington County Health Partners, Inc. and Eileen Smith from the Pennsylvania Department of Health and a Baptist Minister. Ms. Clemons spoke on the Minority Health projects completed by Minority Health Task Force for WCHP, while Eileen Smith presented on violence and minority health. The 2007 Membership Award went to Mauice Rice for his work on the Athletic Fields Project. MTFC and MVH received the Thomas Nega Drug- Free Lifestyle Grant in 2006 from the Westmoreland Drug and Alcohol Commission, Inc. This grant supported the Athletic Fields Project, which placed Tobacco Free Stop Signs at 29 Athletic Fields in Monessen, Belle Vernon, and Yough School Districts. Those athletic associations placing the Stop Sign received $75.00 mini grants. 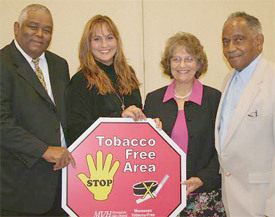 In addition, Tobacco - Free Stop Signs were placed at Mt. Calvary Church, Monessen and the Schooner Youth Center in Monessen. The Monessen Tobacco Free Coalition partners with several organizations to accomplish its mission; To work to prevent the use of tobacco by youth under age 18, to bring cessation classes to Monessen and surrounding communities and to work for a tobacco free environment for people of all ages.